(Dolphin and Union populations are of Special Concern and the Remaining barren ground.) populations are not at risk. Across the Union and Dolphin straits, Coronation Gulf and Dease Strait to the mainland of Nunavut (including Umingmaktok, Kent Peninsula and Grays Bay). For the eight other migratory herds listed above, the destination is the taiga further south. 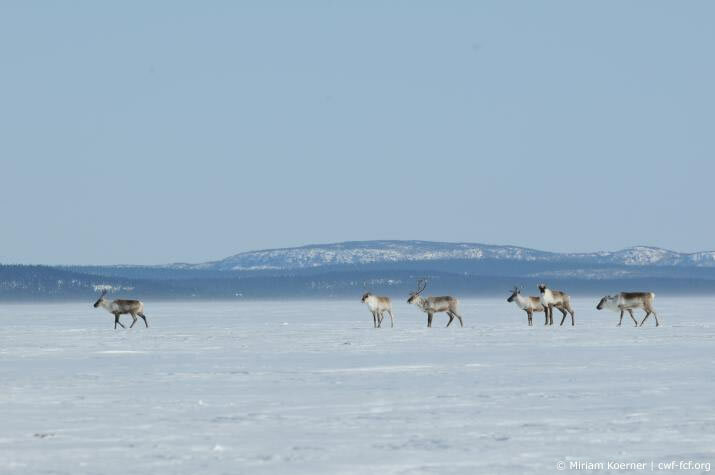 Most barren ground caribou populations migrate seasonally from the tundra to more forested areas of the boreal forest. The remaining non-migratory barren ground caribou populations live and breed in the tundra year-round. With the exception of the Dolphin and Union population which migrates within the tundra. The tundra provides the barren-ground caribou with various plants and grasses to feed on. Their main food source is lichen, but they also eat sedges, twigs and mushrooms. When compared to body size, this species has the largest antlers of any caribou. IUCN (International Union for Conservation of Nature). 2014. The IUCN Red List of Threatened Species. Version 2014.3. iucnredlist.org. Downloaded on 28 November 2014.